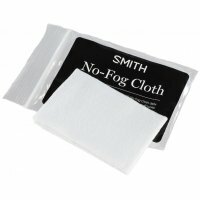 For maximum protection use the Smith No-Fog Cloth daily before using eyewear. Ideal for year-round use on all types of eyewear, binoculars, rifle scopes, and mirrors. For best results, breathe lightly on the lens surface, then gently wipe dry with the No-Fog Cloth. Always use on eyeglasses if they are being worn inside a goggle.